The Parnells : Going, going, gone. Those are AWESOME pictures! 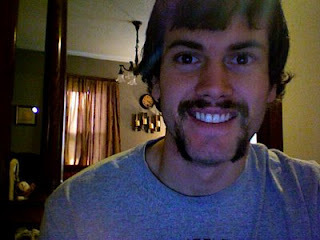 I liked the mustache but the handle bar wasn't bad. 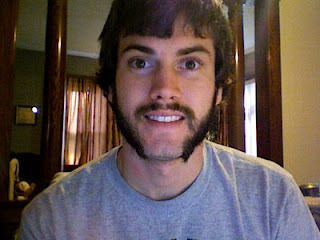 So you like the beard or you don't? oh.my.gosh. I can't stop laughing. You are kidding me?! 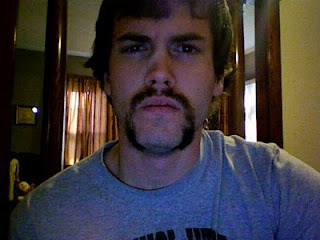 The handlebar was awful and the mustache just looks like his lip is dirty. I have to get used to him being cleaned shaved--he looks super young right now. I love the beard and scruffy look. 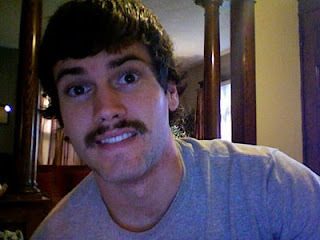 But he always wants to shave it at some point and always comes up with something hideous like those pictures. Then he always threatens to keep it that way...and I'm afraid one of these days he may actually do it! Tell him you love it and want him to keep it--then see if he is willing to leave the house with it. i would take you up on your test. but since Jonathan has read your comment, it's more like a "double dog dare." he's too much of a guy to back down from one of those.